Lead Cutter Mary Ellen Walter has been making costumes for Seattle Opera for almost 30 years. Her expertise spans centuries of fashion trends, and she knows how to get our singers looking good and ready to perform with confidence. 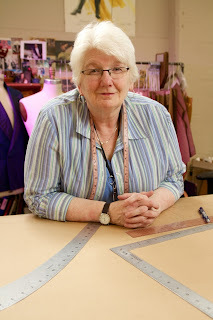 What does a “Cutter” do in a costume shop? We work in teams, with each team responsible for a certain number of costumes for an entire opera. As cutter, I develop the patterns, either by draping fabric on a dress form or simply working out measurements. The first hand on my team “chops them out,” as we say; and we have one to three stitchers on the team who put it all together. By doing it. I got sucked into theater as I was working on a Bachelor’s degree in English, and since I was a girl, they made me work in the costume shop. When I moved to Seattle, working in multiple shops exposed me to lots of different cutters, different styles, different projects...that was my post-grad! And how did you work your way up? It’s not exactly seniority; it’s more skill-based. I was on salary at the Rep once when we had a slow season, so I made it a project to learn how to draft menswear. I need the whole package...music, scenery, acting, great direction. Stephen Wadsworth’s Orphée, in 1988, really opened my eyes to what opera can be. You have some impressive equipment here at the shop. Most of this is industrial equipment, such as the sergers that finish raw edges, and our button-holer. We have a foot-powered grommet-setter for laced-up bodices. Our crafts department is responsible for “distressing” costumes, making them look old and worn and ragged-out. For Parsifal, our team used cheese graters and rasps to destroy things, but it was so hard on their arms and muscles, Susan [Davis, Costume Shop Manager] bought a bench grinder. When you create period costumes, are they historically accurate? We consult historic pattern books...but eighteenth-century patterns are made for eighteenth-century bodies. People are much bigger today. Everybody goes to the gym, and opera singers are what they call in the tailoring book “chesty”—they have prominent chests. So you take the style lines, but not the exact patterns. Do you have a favorite set of costumes you’ve created? Mariusz Kwiecien sang Don Giovanni a few years back, and he’s a dream to work with—he loves clothes and always looks great. Marie-Therese Cramer designed a really fun set of costumes—based on historical shapes, but she twisted them. She and I got on a wavelength where she could say, “You know, a crazy cravat,” and twist her hands in front of her neck, and I knew exactly what she was talking about. What about singers who aren’t as easy to costume as Mariusz? We’ve certainly changed plans drastically if a costume just wasn’t working for a certain singer. Our job is always to make them look good. Do you have strong feelings about updated productions, such as this one? If it works for the story and characters, I’m all for it. I think it makes sense to set Rigoletto in the 1930s. It adds a bit more understanding for a modern viewer. We really know who that Duke is. Can you take us through the process of creating costumes for the Duke? We have Francesco Demuro’s measurements from last spring’s Bohème. It will probably take a week or so to draft his four costumes. We’ll do mock-ups, make some changes on the form, and then cut and stitch the real fabrics to the “fitting point”—sort of a rough draft of the costumes. Then, when he arrives, he’ll have a fitting, and we’ll make any necessary adjustments. What are singers like during their fittings? Some of them just want to get through it as fast as possible. Others are driven to entertain. And some of them, the “self-fitting performers,” may offer advice about how best to costume them—but the thing is, usually they’re right! How do you make Rigoletto’s hump? It’s mounted on a T-shirt, and goes on underneath his clothes. I understand you were involved in selecting Aidan Lang, who will succeed Speight Jenkins as General Director later this year. I was on a committee with the other collective bargaining units, and we met each of the candidates. The process was very transparent. I was flattered that our input meant so much to the Seattle Opera Board. And I think we got the right guy! This Staff Chat first appeared in Seattle Opera’s program for Rigoletto in January 2014. Great post! i like your blog. Keep sharing.